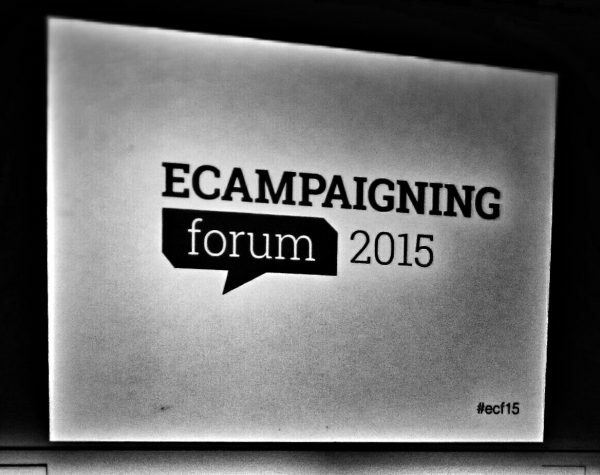 Like any live event these days, participants at the eCampaigning Forum (ECF) in Oxford from the 8-10 April 2015 were hot on the Twitter hashtag, #ecf15. Neo’s own @cpev and @jellyeleanor attended ECF and kept up the tweets on behalf of our @weareneo Twitter account. It’s always difficult finding a balance around how much you should tweet at a live event. You don’t want to be so obsessed with the hashtag stream that you miss out on real-life engagements and interactions with your peers, which of course, is the main reason for attending events like ECF. At the other end of the scale, you don’t want to feel like you’re not tweeting enough and missing the opportunity to share insights with your own peer network. ECF participants found a good balance, with lots of interesting discussion happening on the #ecf15 hashtag throughout the course of the forum. Apparently we even reached 9th in UK trending Twitter hashtags. 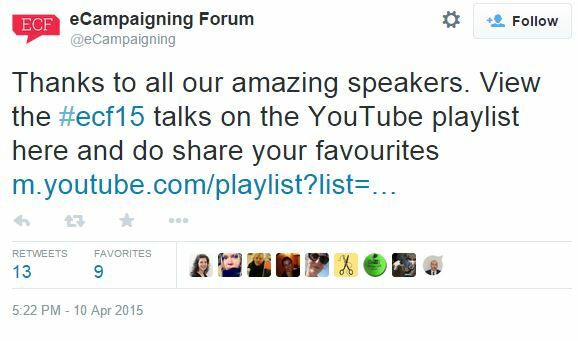 It’s now a few days after ECF finished so we thought it would be a great time to review some of the top tweets over the course of the event – either to reminisce and jog your memory if you were a participant, or feel envious and inspired if you weren’t! 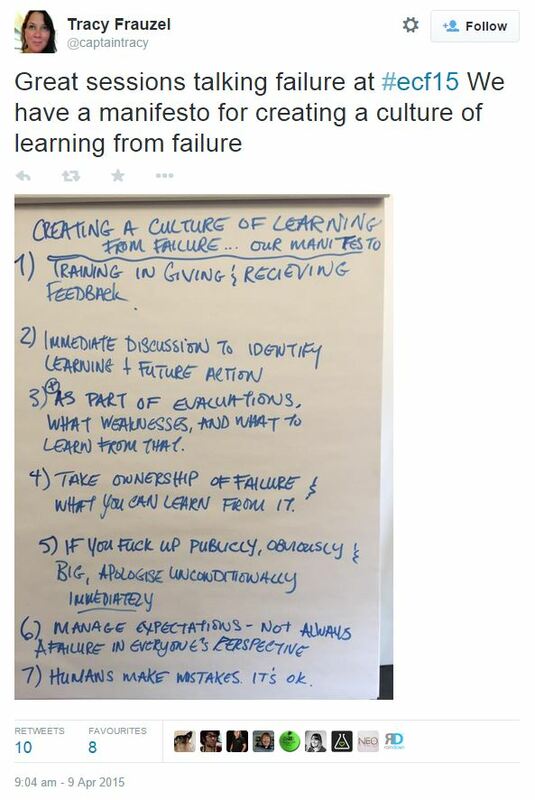 Tracy Frauzel aka @captaintracy tweeted this great post about an Open Space session she took part in. The session was one of many proposed by ECF participants over the course of the event, and focused on how we can learn from failures in a work environment. Tracy shared a photograph of the ‘manifesto’ that came out of this session. Neo’s @jellyeleanor also took part in this session, joining halfway through after making use of the Open Space ‘Law of Two Feet’. Tracy’s post was favourited 8 times and received 10 retweets, which is great considering that the session itself was attended by even fewer participants. Because there were many Open Space sessions happening at the same time, it felt quite valuable to document things like this and share them using the #ecf15 hashtag so others who chose to attend different sessions could also benefit from the things we discussed here. Simon Moss from Global Citizen impressed us all with an opening talk at ECF. One of the stand-out highlights was how their new content strategy was going to be focused around publishing 40-50 pieces of content per week. This was largely inspired by a shift away from ‘every piece of content counts’, instead moving towards a BuzzFeed approach where content lives and dies by audience engagement. There was almost a collective gasp when Simon revealed that 70-80% of Buzzfeed content ‘tanks’, and that they were moving towards an editorial culture which would replicate and accept this approach. 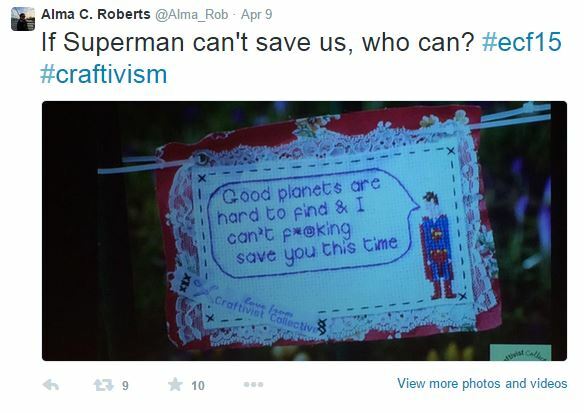 One of the highlights of ECF for a lot of participants was Sarah Corbett of @Craftivists, who presented a fantastic 7 minute ‘Ignite’ talk about the melting pot of craft and activism – craftivism! Sarah was incredibly inspirational and her lovely visual slides complimented the fantastic craftivism that she promotes. There was one slide in particular which was obviously very well received by the audience – I have never seen so many phones come out at once to take a photo during a talk. 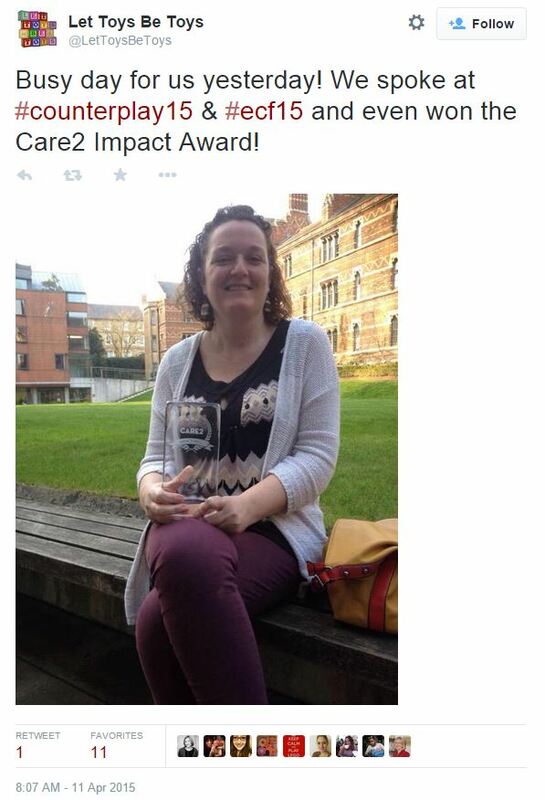 Care2 present an annual Impact Prize to a campaign or initiative in the charity sector which makes an outstanding impact in the field of online advocacy or fundraising. At the end of the first day at ECF, the winner was announced… and it went to the fantastic ‘Let Toys Be Toys’ campaign, which is campaigning against non-gender stereotyping of toys by the toy and media industries. @LetToysBeToys received a phenomenal amount of media attention and hundreds of thousands of shares across the web. Judging by the reaction from the audience, this was a very well-deserved winner. It’s pretty amazing to go to an event where the organisation of the conference is just as interesting as the world-changing content we had all come together to discuss.